WASHINGTON, DC, October 3, 2011 (ENS) – The U.S. Supreme Court today denied consideration of an appeal by the Public Lands Council of previous federal court decisions overturning Bureau of land Management grazing regulations promulgated during the George W. Bush administration. The decision affects over 160 million acres of public land in 11 western states. The Public Lands Council, which represents livestock ranchers who use public lands, was an intervenor in successful litigation brought by Western Watersheds Project, an Idaho based conservation organization. Western Watersheds Project had filed the litigation that overturned the Bush BLM livestock grazing regulations in federal District Court in Idaho in 2006. On September 1, 2010 the Ninth Circuit Court of Appeals unanimously upheld the Idaho District Court’s decision overturning the Bush era grazing regulations as violating the National Environmental Policy Act and the Endangered Species Act. With this ruling, the appellate court affirmed the 1995 BLM livestock grazing regulations created by the Clinton administration and then-Secretary of the Interior Bruce Babbitt. The Bureau of Land Management did not appeal the prior court decisions supporting Western Watersheds Project legal position. “This decision by the Supreme Court stops forever the Bush administration’s attempt to roll back the conservation-based livestock grazing regulations of the Clinton administration,” said Jon Marvel, executive director of Western Watersheds Project, WWP. “Perhaps now the BLM will embrace the conservation intent of the 1995 grazing regulations,” Marvel said. The overturned BLM livestock grazing regulations would have greatly reduced public involvement in the administration of livestock production on western public lands, while creating new property rights for ranchers for water rights and range installations. This has been a good week for Western Watersheds Project in the courts. In Idaho federal district court on September 28, Chief Judge B. Lynn Winmill issued an order overturning the Bureau of Land Management’s Resource Management Plans for the Craters of the Moon National Monument and Preserve in Idaho and the Pinedale Field Office in Wyoming. These two plans affect management on more than 2.5 million acres of public land. The two Resource Management Plans are test cases for all 16 Resource Management Plans being challenged by Western Watersheds Project. Judge Winmill ruled that the BLM did not fulfill the agency’s legal obligations to properly consider the negative environmental impacts of oil and gas development and livestock grazing on wildlife in the two management areas, particularly the greater sage grouse. The BLM has designated the greater sage-grouse as a “sensitive” species under the agency’s 2001 Special Status Species Policy. This policy requires that sensitive species be afforded, at a minimum, the same protections as candidate species for listing under the Endangered Species Act. In his ruling concerning the Pinedale Field Office, Judge Winmill notes that the U.S. Fish and Wildlife Service, “…issued a decision on January 6, 2005, deciding not to list the sage grouse under the ESA. Following a challenge by WWP, this Court held that the FWS failed to rely on the best science and was influenced by a political appointee who intimidated the scientists in an attempt to block listing.” That ruling came in the 2007 case of WWP v. U.S. Fish and Wildlife Service. In his ruling, the judge pointed to oil and gas development as well as grazing as factors in the steep decline of sage grouse populations in the Pinedale RMP area. 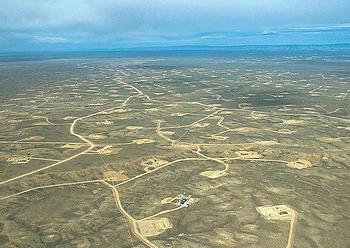 “The Pinedale Anticline Project Area saw an increase in natural gas production of 94% between 2001 and 2006. In another area of the Pinedale Field Office, where the Jonah Infill Project was approved, the BLM authorized in 2006 the drilling of about ‘3,100 new wells at a rate of approximately 250 wells per year for 12 years,'” the judge quoted. To illustrate the dangers of grazing on Craters of the Moon National Monument, Judge Winmill quotes a 2006 Environmental Impact Statement approved by the BLM and the National Park Service. “The EIS succinctly captured the relationship between fire, weeds, and grazing: “Fire creates ideal conditions for cheatgrass establishment, and cheatgrass is highly flammable. The spread of cheatgrass is exacerbated when the native perennial grass and forb community is weakened as a result of heavy livestock grazing,” he wrote. “The EIS noted a 36% decrease in active leks [male sage grouse mating groups] in the last 25 years in the Monument, and a 64% decrease in the last 60 years. The EIS concluded that a ‘major contributing factor’ in the decline of sage grouse numbers is livestock grazing,” the judge wrote.